If you’re looking for information on fence panels in Guildford, Bracknell or Surrey in general; you have come to the right place. For further information give us a call or send us a message on our contact page and someone will get back to you. Lap panels are a fully framed fence panel, which are strong but still relatively light to lift and easy for you to erect. 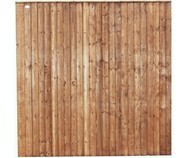 Ideal for use with timber or concrete slotted posts. 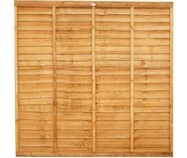 Our lap panels have five vertical battens, whereas most on the market only have three. This means that our lap panels have superior strength and durability, which will save you unnecessary future expense. You can choose between brown or gold colour. 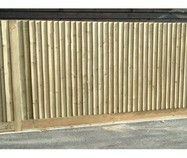 These panels are pressure treated and are ideal for fencing in damp locations. The pressure treatment means the panels will have a longer life against rot, saving you the expense of frequent future replacement. 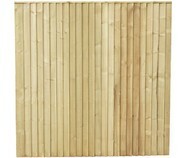 Our lap panels have five vertical battens, whereas most on the market only have three. This means that our lap panels have superior strength and durability, which will save you unnecessary future expense. 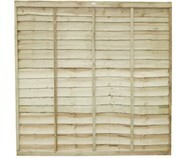 This pressure treated panel is popular and is a natural light colour which is available up to 6ft high. Pressure treated lap panels cost slightly more than the dip treated lap panels due to the quality pressure treatment. Our pressure treated closeboard panels, also known as featheredge fence panels, are heavy duty, incredibly strong and durable panels. The pressure treatment protects the timber from rot and preserves the panel for a longer life span. Our dip treated closeboard panels, also known as featheredge fence panels, are heavy duty, incredibly strong and durable panels. These panels are less expensive than the pressure treated alternative, and come fully constructed, ready to be installed. 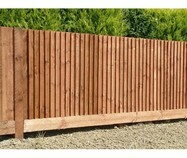 Closeboarded fencing constructed on the job using arris rails, gravelboard, featheredge boards, post and centre support.